For the past few days I've been down at the 'project' in France, alternately working on the house and working on the car (my S2FL Spider 2000). Replacement engine is back in, exhaust headers are fitted (after some seriously blue language) and I'm laboriously putting everything back together. It seems like the car is fighting me all the way, but that may just be down to incompetence, of course. What certainly was incompetent on my part was to not make notes about which cables attached to which connectors before I pulled them apart. I am now regretting this oversight. In particular I am having problems identifying four cables in the oil filter housing/alternator area of the engine bay, including being unsure which cable connects to the tag on the back of the alternator (the two large ones connecting to the binding post were fairly obvious). 1. Quite chunky (i.e. heavier gauge than the others), predominantly Red with occasional White bands, terminating in a white plastic female plug. This cable is by some margin the shortest of the four. 2. Standard gauge cable, predominantly White with occasional Black bands , terminating in a white plastic female plug. Second shortest cable but closer in length to cables 3 and 4. 3. Standard gauge cable, predominantly Yellow with occasional Black bands , terminating in a right angle metal female clip with rubber boot. Second longest cable. 4. Standard gauge cable, predominantly Blue with occasional Black bands , terminating in a right angle metal female clip with rubber boot. Longest cable. All these cables start out as a bundle emanating from the bulkhead area, on the clutch/gearbox side close to the overflow tank. The bundle also contains cables for the in-head sensors. If anyone can assist in identifying which of these cables go where, I will be eternally grateful. Not loads of help I know, but I have a shot of the oil filter area of my old per-facelift car (too big to post @ 1.1mb, we really must sort that!). 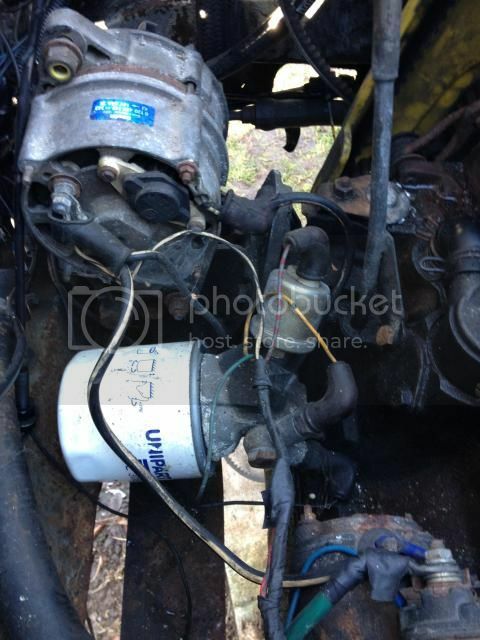 Looks like the rubber booted wires are the oil pressure/warning leads, the latter being shown in the photo. The help stops there though, because the wire on mine seems to have been plain brown. Will have a look at my newer car when I get a chance. Thanks guys, that's a big help. I'd already decided that the rubber-booted leads were oil-related and Lanciamad's photo shows where the yellow/black lead goes, so logically the other rubber-booted lead goes to the remaining spare oil-related takeoff. I'd also revisited the Haynes manual and it shows the white/black lead as going to the alternator, so that's where that is going. Lanciamad's photo seems to confirm that. This is to connect to the single spade terminal on the back of the alternator, not the main, heavy duty connection. I think that last night my brain was fried and I couldn't think straight.